IBM® delivered IBM i 6.1 in March 2008. With 6.1, IBM exploits the capabilities of the Machine Interface (MI) architecture to significantly improve programs. Programs can benefit from better performance, a range of new operating system and processor capabilities, and even stronger system integrity. To enable these improvements, all MI programs created for previous releases must be converted to run on 6.1 or a later release. MI programs include integrated language environment (ILE) and original program model (OPM) programs. To convert a program, its creation data, which is a subset of observability, must be available. MI programs retain creation data by default, so that most programs can be converted, going all the way back to programs that were originally created for System/38. Even if an option was chosen to remove creation data from external access, Licensed Internal Code (LIC) can still access the creation data if the target releases of the program and its constituent modules are V5R1 or later. Thus a program lacks sufficient creation data for conversion only if the program or at least one of its modules was created for IBM OS/400® V4R5 or an earlier release and creation data was explicitly removed. You can run the Analyze Object Conversion (ANZOBJCVN) command on V5R4 or V5R3 to help plan for your upgrade. The ANZOBJCVN command identifies programs that will not convert to run on 6.1 or later releases, if any, and estimates the times that are required for the program conversions. It also provides information about two other types of conversions: integrated file system names and spooled files. You can access the ANZOBJCVN command by loading and applying the appropriate PTFs that are listed in this paper. This IBM Redpaper™ publication is intended for system administrators and field technicians to help them understand and prepare for upgrading or migrating to 6.1 or a later release. It explains what the program conversion is and why programs are being created or recreated on 6.1 or a later release. It then provides detailed steps for using the ANZOBJCVN tool on V5R3 or V5R4 to prepare for object conversions. Finally, it discusses the program conversion methods for converting programs to run on 6.1 or a later release. Note: The first edition of this paper was entitled IBM i5/OS Program Conversion: Getting Ready for i5/OS V6R1, REDP-4293-00. 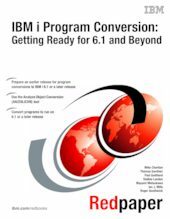 The title of this second edition has been slightly modified to IBM i Program Conversion: Getting Ready for 6.1 and Beyond, REDP-4293-01, to reflect the new naming conventions for IBM i.